The Nintendo GameCube (ニンテンドーゲームキューブ, Nintendō Gēmukyūbu), officially abbreviated as GCN and unofficially as NGC, is Nintendo's fourth home video game console and is part of the sixth generation console era. It is the successor to the Nintendo 64 and predecessor to the Wii. The Nintendo GameCube is the first Nintendo console to use optical discs as its primary storage medium, after several aborted projects from Nintendo and its partners to utilize optical-based storage media. In contrast with the GameCube's contemporary competitors, the PlayStation 2 and Xbox, the GameCube uses miniDVD-based discs instead of full-size DVDs. Partially as a result of this, it does not have the DVD-Video playback functionality of these systems, nor the audio CD playback ability of other consoles that use full-size optical discs. 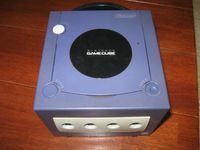 In addition, the GameCube also introduced a variety of connectivity options to Nintendo consoles, and was the third Nintendo console, after the Nintendo 64DD, to support online play officially, via the Nintendo GameCube Broadband Adapter and Modem Adapter. It also enabled connectivity to the Game Boy Advance to access exclusive features of certain games or to use the portable system as a controller for the Game Boy Player. The console was released on September 14, 2001 in Japan, November 18, 2001 in North America, May 3, 2002 in Europe, and May 17, 2002 in Australia. The GameCube sold 21.74 million units worldwide. Source: Wikipedia, "GameCube", available under the CC-BY-SA License.